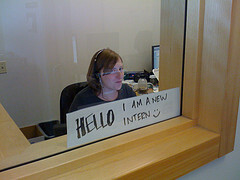 Let’s face it – internships are no longer a nice to have. These days, they are a must before you get out there to look for full-time work. And if you’ve found your way to any Internet job board, then you already know that growing companies are the place to find internships. Becoming an intern provides you with a lot of opportunities – the opportunity to learn, to get paid or receive credit, to learn new skills, network and make professional contacts. How do you ensure that you’ll find success during your internship? Here’s a list of the top-five things to keep in mind before your even walk through the door. This is a guest post from Loren Porat. She wants you to keep these in mind as you travel along your internship path – she’s sure you’ll be pleased with the results. Loren is from Urban Interns, an online marketplace that connects high-growth companies with talented candidates looking for internships, part-time jobs, freelance work and contract positions. I don’t know if I’d call this an internship per se but I once suggested to a friend of mine who was in the broadcasting business that he offer to work at the local tv station on a part-time basis for free after he’d been laid off elsewhere and couldn’t find work. I figured he’d at least be keeping busy, perhaps making new contacts and could keep his resume updated with the experience he was getting since they weren’t actually hiring at the time but needed some help. Sure enough he did end up getting a fulltime job offer from this employer so it worked out ok for him. The world is an as uber-competitive as you would think. I am amazed at the lack of quality candidates available. A steady track record is impossible to find. While I had an intern type position I quit after 5 weeks because a real job came through. I did not give up much. Xerox had an intern for 11.50 an hour and ran it as a national competition. I truely felt sorry for any one that thought they had a chance. I knew I could not afford to even apply as I needed to make real money over the summer.